I was poking around in the leaves at Cape May Point State Park last week and I found this saucy wheel bug nymph, Arilus cristatus. Click to enlarge. 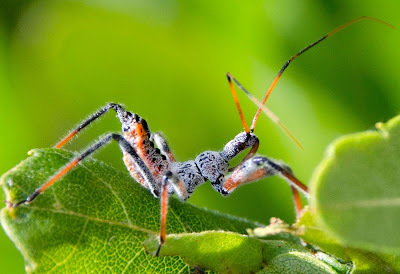 It's an immature form of the fine adult wheel bug pictured above. See that long sharp beak at its mouth? Wheel bugs are predators of other insects. They feed by piercing prey with their beaks, injecting salivary fluids that dissolve the victim's insides, and then sucking them up. Wheel bugs belong to an insect family known commonly as the assassin bugs. Nothing makes my day like finding a wheel bug.